Every marketer feels the pressure to demonstrate value to their respective organization. Drive more revenue, increase conversions, lower the cost-per-lead — these demands are top-of-mind for marketers and motivate our work. But marketing departments can do more than generate revenue for an organization. Marketing is positioned to serve as a business insight generator. With statistically significant data from experimentation, we can interpret our audience’s behavior and shed light on customer motivations. Unfortunately, not every experiment is viewed as an opportunity for insights. Experimentation has been reduced to a Magic 8-Ball that tells you what to do based on the result of an A/B test, but does not reveal the “why” behind the “what” of a customer action. This short-sighted experimentation is an inherent flaw in marketing’s approach toward testing, and leaves us thirsty for actionable insights. Below are three ways to take your marketing experimentation to the next level. Some of the best experiments start with the best questions about a client’s buyer persona. Would persona Cindy be more willing to convert if she knew our client was certified in the service they perform? Or is locality more important to her? What test can we conduct to find this out? If you’re not feeling curious, make a list of client problems that need solving or a list of assumptions to test. Better yet, ask your sales team for questions they have always had with their audience. If we think of marketers like scientists, then it is right for us to identify a control and variable in our experiments. Like a scientist, we should test one variable at a time in our experiments so that any result or effect from the test can be attributed to one, singular change. Limiting your testing variables is not to say that you cannot conduct multiple experiments at one time. Marketers are free to split test banner ad creative while testing a variable on a landing page. Just be mindful of where your experiments intersect to avoid competing influence on your audience. 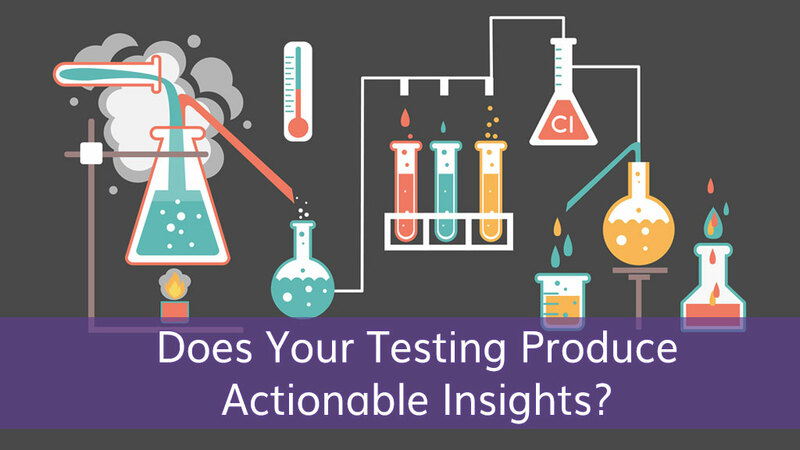 The insights we generate from testing transcends the marketing department and can impact all facets of our business, from sales call scripts to traditional media, branding and even market segment. With this in mind, choosing the right test is a critical first step in generating the insights that will increase the value of marketing within the organization. Many articles offer ideas of what to split test, but only you know what question or problem needs to be tested to reveal the best information for your business. According to Peter Kochley, founder of Upworthy, “we rely on testing to just make better decisions. People are really fascinating and interesting…and weird. It’s really hard to guess their behaviors accurately.” Of course, don’t be afraid of trial-and-error. When we learn to choose the right test, experimentation becomes the impartial mediator between what marketers don’t yet know and challenges our strongest assumptions. Here are some experiment ideas to get you started.